Problem: I have at least one MTB with a dropper seatpost that does not allow for clamping on the seatpost itself and there is not enough room between the rear tire and seat tube to get the jaws in safely without binding the rear tire/wheel or risking damage to the frame. Obviously I do not wish to use any other frame tubes as clamping points but I still have the need to remove both front and rear wheels while clamped... I'm kind of at a loss as to how to approach this problem. I have a stand that I've been using for a number of years that is the industry standard for clamping on a seat post but this new dropper just doesn't allow for that option. I have entertained making a suspended "stand" that is connected to my shop ceiling with pulley and connects to the bike at the handlebar/stem and at the rear seat stay bridge but the design is still bumbling around in my gray matter as to how to keep the bike in a stationary and rigid position so as to properly service it. Anyone else here run into this issue or have experience with clamping MTB w/ dropper posts in a non-traditional work stand? Never clamp the upper with any clamp, because any scratches or other surface damage (surface imperfections, really) can have a deleterious effect on the wiper seal, either wearing it or making it less effective. I just don't do it because I don't feel there's a way to get the chance of damage reasonably close to zero for my liking. It is true that by cleaning everything and using a clean rag around the clamp pads, it will probably be fine. An important point here is that dropper uppers are smaller tubes than clamps are sized to clamp well to begin with, and then they're polished and coated with friction-reducing materials, for the net effect that especially once you have a rag in there, the bike will tend to want to twist in the stand constantly, which in addition to being annoying is how scratches happen. Some might argue that being a bike part in use is not hazard-free anyway, and so worrying about scratching the upper having taken reasonable precautions is splitting hairs, and that is pretty reasonable in many contexts. But for those of us who work on either peoples' bikes for money, the goal really should be doing zero harm, plus having the bike twist easily in the stand all day is fairly untenable. I'm willing to clamp gently around the collars of most internal droppers, especially the more OEM-y ones. The connection this makes is kind of wobbly and annoying also, but I don't think you're going to hurt anything doing this. On external posts, the cable will usually be in the way too much. I think it's basically fine to hang bikes by the saddle on droppers if, and only if, the post is fully extended, but you have to be very judicious about this. Breaking this rule can draw air in to the post and cause real problems, and on that basis one could make the argument to flat out avoid this practice too. Some have already coalesced around this line of thinking, but many of us are just too dependent on the time savings of hooking bikes by the seat for fast repairs, event storage, etc. Reverbs in particular are sensitive to this. Even though for most cable-actuated posts it hypothetically can be fast and fairly painless to simply remove the post, unhook the little Knarp-like anchor barrel, and put in a surrogate post or an internal clamp, usually it's too much hassle. But in lieu of other alternatives or if you need to totally eliminate any risk to the post or frame, especially if you'll be doing significant work on the bike, this approach has its place. Usually what I do when the bike will be in the stand for a while is utilize one of the modern screw-down style repair clamps with longer/larger clamp pads, clean and in good condition, to just clamp a frame tube. My favorite for the purpose is the Park Extreme Range Clamp family, but similar ones such as the Feedback/Ultimate clamps are good too. I have a lot of confidence in these to not hurt frames, although you have to use good judgment when doing higher torque operations on the bike. (Again, surrogate posts or internal clamps are what you need if you want to just not worry about damaging anything.) Another benefit of clamping a frame tube is that you're then able to do work on the dropper itself, ie changing or resizing the cable and housing, with the bike in the stand. The other alternative is having the bike on the ground and bending over it or kneeling. That would be fine if dropper work was only an occasional thing, but it's not anymore, and you need to be able to get into them without hurting your back or crawling around on the ground. There's a separate discussion here about screw-down versus cam-over styles of clamp, cam-over being the more traditional type. Cam type clamps by nature expose the frame tube to quite a bit more force during clamping than at their final resting position, and are quite hazardous for thinner/carbon frame tubes. 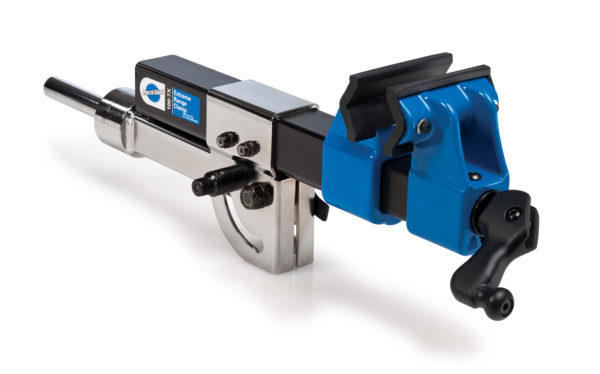 Screw-down style clamps are very different and let you use a bare minimum of force. I don't favor the current Park "Professional Micro-Adjust" clamps for this quite as much because of their short clamps, which is great for seatposts but not for frames. If possible, marking and raising the post and sliding up enough housing to secure it in this position so you can clamp the lower part of the dropper is another option, but this part is quite sensitive to crushing so I don't like doing it with cam type clamps. I think it's generally fine to do it with screw down style clamps and a real bare minimum of pressure, although here I probably wouldn't on a fancier one. With this approach you have to mess around scooting the cable housing back and forth, which is easier on some frames than others. And if the housing was the perfect length before, i.e. no longer than needed to avoid kinks when turning the bars, then you won't be able to turn the bars all the way with the housing scooted up like this, which is a problem if you were planning on on installing new housings or hoses on something else. 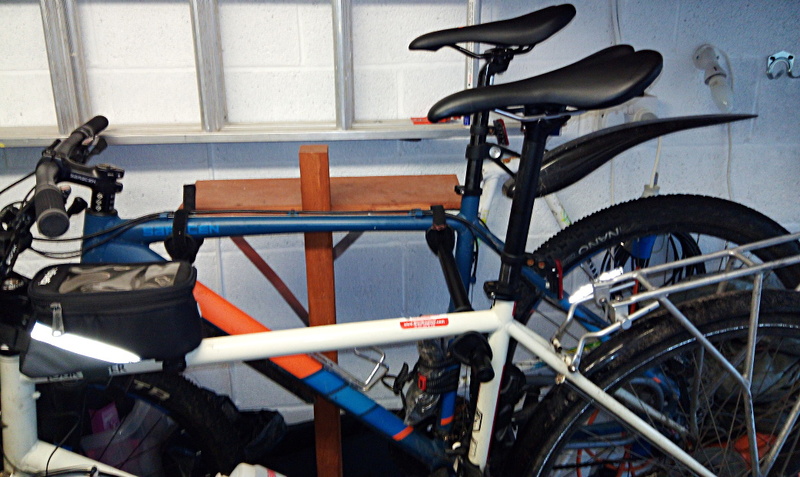 My work stand is based on an old car rear rack, and supports the frame under the toptube, just in front of the seat tube and near the headset. I use the original plastic brackets with straps to hold the bike steady. The main problem with clamping a dropper post by its retractable part in a repair stand: if the claw is dirty it may scratch the moving part of the post. Scratches will then travel back and forth through the seals damaging them and allowing dirt to enter the post's internals. Otherwise, for a fully extended seatpost there should be no other issues with clamping it. Clamping a carbon frame,on the other hand, by the seat tube poses a different risk of crushing it. To prevent scratches, keep the stand's claw free of sand and dust, and/or wrap the seatpost in clean cloth every time before clamping. Thule is offering Bike Frame Adapters (Thule 982) for their Transport Solutions, i guess these can be also used to clamp the bike in a stand? If possible though I’ll clamp on the seat tube and turn the bike so I can still spin the cranks. For kids bike where there is absolutely no space I’ve clamped the head tube! I'm not super familiar with dropper posts so this may be a stupid idea, but can you remove the dropper post and put in a non-dropper post (no seat needed even), and use that to clamp? 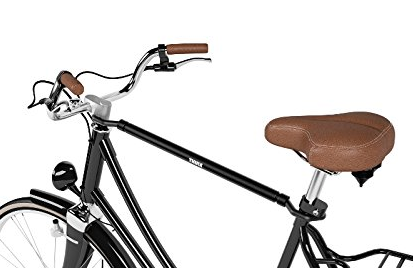 If the dropper has internal routing, so you have to deal with the remote control cable, can you zip-tie through a saddle rail to the frame to let the dropper post + seat sort of hang carefully next to the seat tube, or inline with the top tube to not stress the cable? If that works, the temporary clamping seatpost could be the cheapest post you can get your hands on, and you could keep it on hand for this purpose. Not the answer you're looking for? Browse other questions tagged repair repair-stand dropper or ask your own question.